Anakin and Padme married at the end of the last film, and now Padme is pregnant! Anakin is still bothered by the death of his mother, and continues to profess that he will never let anyone he loves die. He soon has dreams of Padme dying. In the meantime, the politician who studied Anakin in the last film has become Emporer. He seeks a private meeting with Anakin where he reveals that he practices a dark art which can prevent Padme from dying. Although the Jedi have become Anakin’s family, the Emporer invites Anakin to betray the Jedi and serve at the Emperor’s side in order to save Padme. Anakin follows the Emperor, but in doing so alienates Padme. 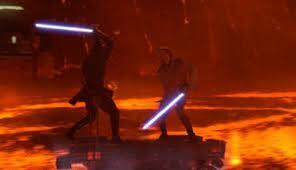 He is badly injured in a fight with Obi-Wan, who considered Anakin a brother. 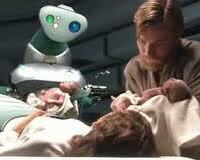 While Anakin is recovering from his injuries, Padme dies in childbirth. The Emperor tells Anakin that Padme's death was a result of Anakin’s rage. Anakin cries out. 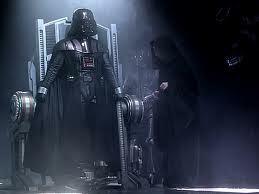 Left with no one to love, he continues to serve the Emperor as Darth Vader. Two children were born to Padme, but they are hidden from Anakin. Their names are Luke and Leia. Anakin never had a father and is faced with the prospect of becoming one. We aren’t told his thoughts. Throughout the first three movies, Anakin seems to have been looking for a father figure – first attaching to his owner, Watto; then to Qui-Gon, the Jedi who rescued him; then to his trainer, Obi-Wan; and finally to the Emporer. 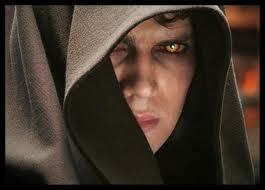 The people close to Anakin become fearful of him because of his anger. As a result, they choose to keep his children hidden from him. To Luke and Leia, Anakin will become a mysterious, absent, unknown birth father. The children's mother dies in childbirth. One of the children is given to a senator, who explains that he and his wife “always dreamed of adopting a baby girl.” The other child is sent to live with his extended family. The siblings are not told of each others’ existence. Star Wars: Revenge of the Sith can serve as a cautionary tale: about being controlled by fear and about thinking in absolutes. It’s a darker, heavier movie than others in the series, but it sets the stage for much redemption in episodes IV, V, and VI. 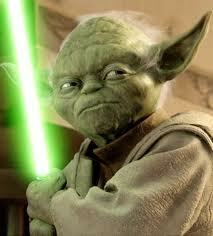 In a previous movie, Yoda cautioned Anakin that fear would lead to anger, hate, and suffering. In this film, dark-art practicing Count Dooku tells Anakin, “I sense great fear in you... You have hate, you have anger, but you don’t use them.” This reminds me of a scene in Meet the Robinsons, where a villain encourages a boy to hold on to his anger and be driven by it. 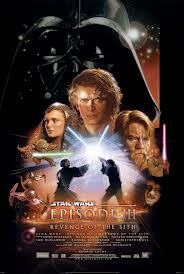 This movie does show the negative impact of Anakin’s anger, but because Anakin has been the protagonist for the first two films, the message could be confusing for some viewers. Anakin gets advice from a Jedi master. Yoda starts by admirably challenging Anakin’s pervasive fear, “The fear of loss is a path to the dark side. Death is a natural part of life.” But then Yoda tells him not to mourn or miss for those who have died, because “attachment leads to jealousy” and is “the shadow of greed.” To avoid evil, Anakin must “train… to let go of everything [he fears] to lose.” Many children in foster care and many adopted children can relate to feelings of loss and grief. The first part of Yoda’s counsel is good: don’t be controlled by your fear of loss. Yoda’s advice resonates with Anakin, who thinks in absolutes. He tells Padme that the Dark Side is for those who are only selfish, and that the Jedi are purely selfless. Later, A Jedi advises Anakin that thinking in absolutes leads to the dark side. Anakin feels excluded – or at least underestimated – by the Jedi. His anger at feeling slighted and his fear of loss, make him more likely to side with the Emperor. It could be helpful to explore the multiple motivations for Anakin’s action. Star Wars: Revenge of the Sith is geared towards teenagers. It’s a violent, dark, and deep movie which could lend itself to some valuable conversations. It’s particularly worthwhile because of the redemption which occurs over the next three movies – Anakin is reunited with his son, and their relationship is ultimately healed. The issues of loss will likely be relevant to many children, but could be quite painful to explore. The violence in the film surpasses the violence in the previous film. The movie would be best suited to kids 13 and up. Yoda tells Anakin that attachment leads to fear of loss, which leads to anger, hate, and suffering. What do you think? Is there a way to attach to people or care about them without being brought into hate? Why did Anakin side with the Emperor? What do you think of his logic? Of his choice? Who did Anakin think of as his father? How do you think he felt about getting ready to become a father? Which parts of the movie disturbed you the most? Which did you like the most? I like you more balanced advice.